Welcome to Trinity Foot Center! When you’re here, you can rest assured that your feet are our top priority. Led by Dr. Lisa Brandy, we are a team of foot and ankle professionals with a passion for keeping Texans on their feet. We treat any and all ailments of the feet and ankles, from heel pain and ingrown toenails to athlete’s foot, warts, dermatitis, diabetic wounds, and more. Our physician and medical assistants spend most of their time listening to you, so that they can understand your concerns, fully explain your condition, and respond with the best treatment options for you. We work hard to make sure that all of our patients feel welcomed, respected, and listened to. And we’re equally passionate about making sure we have all the advanced treatment procedures you need to recover quickly from foot and ankle pain. At Trinity Foot Center, we believe that a doctor and patient become a team for treating an individual’s feet. Our physician and medical assistants spend most of their time listening to you, so that they can understand your concerns, fully explain your condition, and respond with the best treatment options for you. We work hard to make sure that all of our patients feel welcomed, respected, listened to, and are empowered to take ownership of their medical care. And we’re equally passionate about making sure we have all the advanced treatment procedures you need to recover quickly from foot and ankle pain. Dr. Lisa Brandy is the owner and physician of podiatric medicine and surgery at Trinity Foot Center. 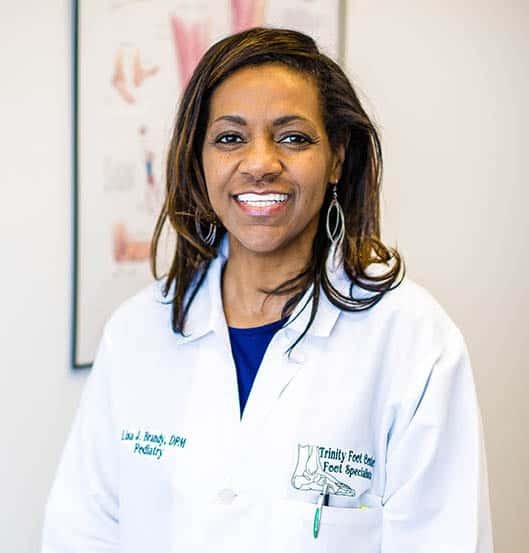 She earned her degree from the Ohio College of Podiatric Medicine, and has more than 20 years of experience diagnosing and treating all conditions of the feet and ankles. Come See Us in DeSoto! To schedule an appointment with us a, please give us a call at (972) 293-9650, or use the contact form on this website. If you’re a first-time patient, we encourage you to read our new patient information and complete your new patient paperwork ahead of time to make your visit even more convenient and comfortable.